With such a strong focus on performance these days, it is easy to forget that sometimes it is the journey, and not the destination, that has the greatest impact. Time-poor individuals often look for a quick fix in order to be able to move to the next task on their list, and the quest to avoid individually attributable failures in the organizational context has fostered a certain level of mediocrity. At Sweetspot we often talk of Insight Management to improve campaign outcomes and long-term performance. And whilst a performance-driven orientation can most certainly have a positive impact in both the short and long-run, the benefits of a learning orientation should not be overlooked. Learning oriented individuals focus on and actively seek new knowledge and skills, and continually aim to broaden and deepen their current expertise and understanding. Not only do they focus on the task at hand, as a performance-oriented individual would, they also attempt to continually learn from each experience or insight that arises, and experiment to consider all outcomes. Furthermore, learning-oriented individuals seek feedback in order to make use of the knowledge of others and reflect on what they have seen and learnt. The benefits of this focus on learning cannot be underestimated. Not only do these individuals constantly increase their knowledge of areas they are not strongly experienced in, but their ability to seek feedback, reflect and hence identify where they require further development increases their self-awareness which can in turn improve their decision-making capacity. This is the result of feeling secure in learning, making mistakes and the lack of a need to avoid uncertainty and accountability. This constant quest for information goes hand in hand with collaborative learning, as individuals continually request the input of more knowledgeable colleagues to keep on learning. A learning orientation does not always lead to continual improvement in performance, however. 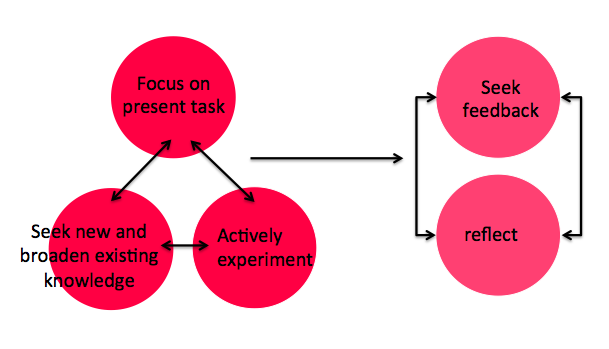 In the case where the individual takes on too much and loses focus on either the present task or learning, or where they do not thoroughly experiment, their learning can fall short. In addition, where feedback is not given and reflection is not undertaken in a structured and timely fashion, continual learning will be interrupted. The definition of clear roles and responsibilities in workflows allows users to concentrate on the most crucial tasks. Objectives also keep focus on tasks that contribute to both long-run and short-run performance. Access to as much or little information as you want helps individuals maintain focus on the information most relevant to their role and responsibilities, but also provides the ability to consume a much greater range of information. Nesting dashboards, or linking to dashboards defined for individuals with different roles/responsibilities, allows users to keep increasing their knowledge and draw on the expertise of others. Experimentation is also encouraged by allowing users to record actions undertaken on their dashboard and then see the true impact of this on performance. Feedback is easy to provide and access as comments/suggestions/recommendations are evaluated and critiqued before being approved or rejected by colleagues. This ability to build conversations around suggestions encourages collaboration between individuals and the ensuing knowledge sharing increases the understanding of all involved. Alerts in workflows also mean that feedback on suggestions arrives in a structured and timely manner. Reflection is easy to undertake when you have access to all historical conversations and are able to see the impact of actions on performance. Is your organization able to maintain a learning orientation? What are your greatest barriers to maintaining this focus on learning? VP of Business Development for Sweetspot. Responsible for strategic brand development, marketing and business development. BA/BComm graduate from the University of Melbourne. My passion lies in finding creative solutions and encouraging collaboration.